Formed by the consolidation of UA Locals 221 and 463, United Association (UA) Local 401 is a premier construction trade union of Plumbers, Steamfitters, Welders and Apprentices. Building on our long history of excellence, our Local will continue to be an integral part of the industries and communities in which we live and thrive. Our vision is to be a multi-facetted, multi-talented workforce that assists our contractors achieve on- time, on-budget construction in a competitive, performance-based and safety-driven environment. We are also able to bring in skilled trades people form beyond our Locals’ borders in order to meet the manpower needs of larger projects. We have taken a proactive approach to reducing the gap in wages for Union vs Non-Union skilled trades. We have also developed a Market Recovery Fund that provides financial assistance to our Contractors during the tendering process to ensure their bids are competitive. 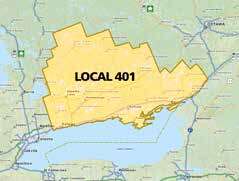 UA Local 401 is increasingly asked by many project developers to take on more of a business development role for major projects prior to their approval. This often includes advocacy of the project’s benefits to municipal, provincial and federal governments. We are pleased to be our Contractors’ committed partner in getting their projects approved and off the ground.